Butterfly - The Magiclay Trading Co. These 4 Steps offer simple strategies that will lead to original creations. Certain steps may be omitted or extended depending on level of creative spontaneity, skill and knowledge of subject. Find pictures of birds, insects, fish, animals, flowers, faces and people. Discuss the shapes of these subjects. 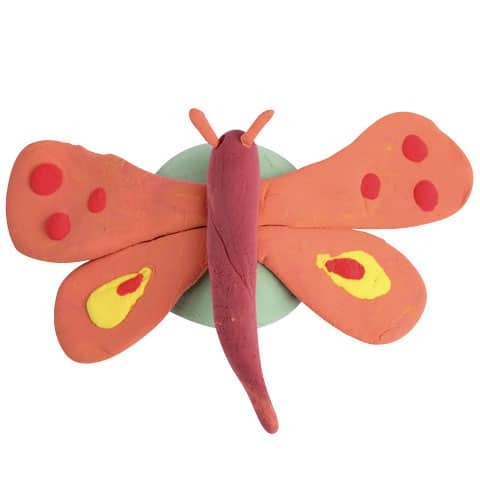 Make a display of different subjects; this helps to raise awareness of the different shapes and body parts of eg an insect or the shape of a fish tail. Take a piece of paper and fold into 6 or 8 squares. Place a magnet “button” in the middle of each square and draw around it roughly with a pencil to make a circle. Sketch an idea using the drawn circle as a guide. Do not limit drawings to the inside of the circle as the model can extend 1–2 cm outside the magnet shape. Use your imagination – perhaps add different parts of one animal to another to create an imaginative creature. Try using exaggeration, elongation, and repetition in drawings. Take a golf ball size piece of Magiclay. As you discover different ways of manipulating Magiclay, share your ideas, techniques and discoveries with others. Refer to Modelling Skills Chart (see below) or make you own chart based on findings. Hands as Tools: with different parts of the hands, try squeezing, twisting, rolling, pinching, tearing/pulling, pressing to make different shapes; try joining and smoothing a surface. Use these techniques and skills to make different parts of one or two of the subjects in Step 1. Using Tool Set: create different lines, textures and patterns. Discuss which of these could be used on different parts of a particular subject eg the indentations created with the blade looking part of the tool could look like the veins on a butterfly wing, or the “cup” marks could add texture to clothes. Using Other Tools: try cutting, trimming and fringing with a pair of scissors. Find items that could be used as tools eg a fork could create repetitive indentations. With newly acquired skills, practise making different parts of chosen subject and joining parts together.